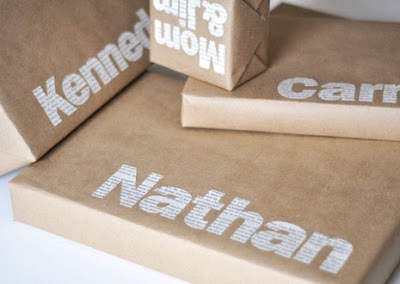 Random Anny .Com: Do you have a "trademark" gift wrap? 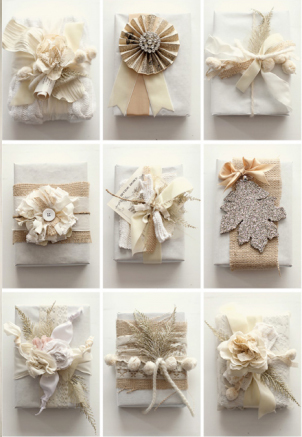 Do you have a "trademark" gift wrap? This is the underside of my Christmas tree. As you can see I ran out of the blue and white snowflakes roll and moved on to a red one about 85% through the wrapping process. One of the wrapping ideas the internet is always pushing is having a "trademark" paper - wether it be a roll of white from the butcher's shop, blank newsprint or brown craft paper. The argument is always for cohesiveness and value. I tried brown paper once. I dressed it up with ribbon and bows but it still looked like I ran out of real paper and went with shipping supplies. This look would probably work if I were a country chic or ironic hipster type but I'm not so...there ya go. Perfect for the near sighted AND the present loving! ﻿﻿﻿﻿Update: A friend passed along the above image and said this is what paper coverings are supposed to look like. She obviously did not see under my tree where the only bows are part of the Free ECB deal at CVS last year. In declutter news I chucked a few things from the bathroom including a back scrubber I can't remember using in the past year. Ooo, I love this!! If I were capable of wrapping presents at all I would want to do this.